Scheduled – Second Life will be undergoing scheduled inventory maintenance from 5:00 AM to 7:00 AM PST on April 10th, 2019. During this time, residents may have issues with any inventory related activities including building, logging in, as well as avatar and object rezzing. Please refrain from rezzing in-world, in addition to transacting in-world, on the Marketplace, or on the Lindex during this time. This coincides with the grid update in the RC channels. So, expect problems. PS: Maybe not. Deploys says no rolls Wednesday. Why am I crashing constantly… is a growing thread in the SL Forum. I’ve been hearing of this problem since about December-January. Then it was only older computers and viewer versions. However, it has been growing. With the last main channel grid update, the problem seems to have exploded. The Lindens have commented on it, Darn Teleport Disconnects (4/8). People currently have various ideas as to what is happening and how to fix it. There currently is no fix. So, don’t be doing drastic things; clearing cache, reinstalling, clean reinstalling, reinstalling Windows… none of these things are going to fix it. Depending on who you talk to it is Animesh that is the cause or Enhanced Environment Project or the upgraded OS the servers are being updated to or it is the move to the cloud (we aren’t there yet). Take your pick. All causes have people unaffected by the it-is-this-cause. As some users and the Lindens understand the problem it is server side. So, all viewer brands are going to suffer the TP disconnect problem. I’ve seen it with Firestorm and the Linden’s SL Viewer. Posted in Firestorm, Second Life, Server, Singularity, SLV2, 3, 4, 5, & 6 Series, Viewers. There was lots of detailed information in the third-party dev UG meeting last week. We got a bunch of information on what is happening with a couple of problems. Currently, disconnects and detachments are front lines. The main channel rolls to #19.03.15.525315. This is the OS upgrade. It includes the EEP support. The RC channels Blue Steel, Le Tigre, and Magnum will be the first version with UDP asset fetching disabled or removed. See the Tools & Tech section of the SL blog Obsolete Asset Fetch Disabled for more details. The RC channels will have a change that is hoped will help with the disconnect problems people are experiencing, which seems to have started in December or January. Some think EEP is causing the disconnects. EEP is coincidental with the disconnects. The current analysis of the problem suggests it is in the TCP communication between the viewers and servers. In the March 29, Third-Party Dev UG meeting Oz talks about the problem and why it took the Lindens so long to notice. Video Basically, the problem is not showing in the performance stats the Lindens watch. The disconnects seem to fall into groups, those occurring during a teleport and those that are periodic (disconnect every so many minutes). People trying to chase the problem down are having problems reproducing the disconnect. They have the problem rated as #1 & #2 and have lots of people on it full time plus a QA team of remote users, meaning far from the Lab distance-wise. Posted in Black Dragon, Second Life, Server, SLV2, 3, 4, 5, & 6 Series, Viewers. Tagged EEP, Problems. WARNING: ASUS motherboard users, you have been attacked. Users in Russia (18+%), Germany (16%), France (12+%), Italy (6+%), and the USA (5+%) are the main targets. Once upon a time, there was a demoness. The virus was transmitted via infiltration of the ASUS update system. As the system provides Certified patches most anti-virus programs failed to detect it. So, you may have updated and opened the doors without your AV warning you. Posted in Second Life, Server, SLV2, 3, 4, 5, & 6 Series, Viewers, Warnings. Last Friday was the Third-Party Dev UG meeting. The meeting ran for 52 minutes. RC viewers to update in week #12. As of today, not yet. Security update for Chromium revealed some problems. Google has been updating all their Chrome products with the security patch. Oz Linden is encouraging all dev’s to update. That translates to users as a reason to get the next set of viewer updates. This set of updates takes care of a problem that is in the wild and being used. I’ve heard you have to visit a malicious website for the exploit to be used. The EEP, BoM, and EAM versions of the viewers are waiting for server-side updates. The hope is the server updates will make it through this week (#12). Rider Linden says the plan is for the EEP simulators to roll grid wide. Currently, EPP is on Blue Steel and Le Tigre RC channels. If they advance, it will be a big step for EEP (Enhanced Environment Project). Posted in Black Dragon, Second Life, Server, SLV2, 3, 4, 5, & 6 Series, Viewers. So, I have reposted week 10 news in the previous article. No server Deploy post as of Tuesday morning. There is a 16-hour old post this morning in last week’s that says no rolls this week… So, I guess no rolls. OH… WAIT… The post appeared just after noon. Main channel no roll. Remains on #19.01.25.523656. Blue Steel and Le Tigre roll to version #19.03.07.525089. The changes are Internal Fixes (shocker) and fixes to EEP. Magnum gets version #19.01.25.523656. Just Internal Fixes. I am seeing a few more people post about being logged off at 15 to 20 minutes. Some European people are dealing with huge packet loss. Russians are protesting Putin’s isolating the Russian Internet net from the rest of the world. Many thought it impossible. But China has done it, Google is helping. So, it looks like Putin will do it. Posted in Black Dragon, Nirans Black Dragon, RLV, Second Life, Server, SLV2, 3, 4, 5, & 6 Series, Viewers. This is a repost. It seems to have poofed shortly after I first posted it. Problems continue on the server-front. No updates on the main or RC channels. These problems are holding up viewer releases. EAM, EEP, and BoM are all waiting for server-backend stuff to update. Any region that has run longer than 10 days will get a restart. The Enhanced Environment Project is progressing and nearing completion. Thursday Feb 14, 2019 Rider Linden updated us on where they were in development. (Ref) He is expecting the project to move to RC status very soon™. It is now available to test in its ‘project status’ in the Blue Steel and Le Tigre channels of the main Second Life™ grid. So, it may be time to start playing with the feature. Also, with this feature comes a new item, EEP-Windlight settings, that can be sold on the market place and traded among users. If you have a talent for making sunsets, this may be your niche. 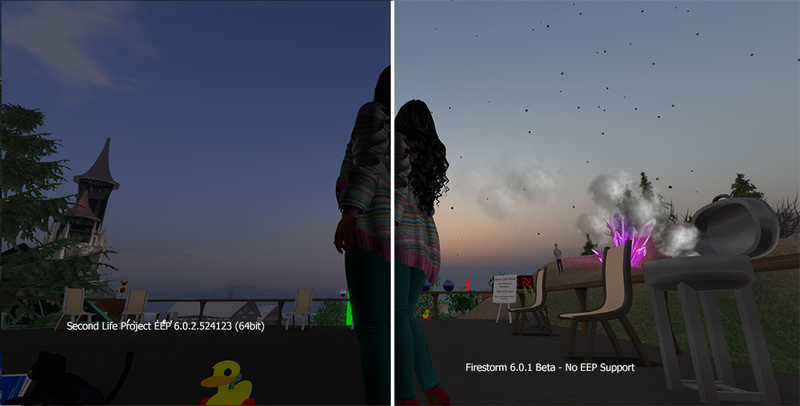 You can get a copy of the Enhanced Environment Project viewer in the Second Life™ Alternate Viewers. As I write we are on version 6.0.2.524123 of this project viewer. It installs in its own directory. So, it won’t break or affect any of your other installed viewers. Updates to this viewer are mandatory. Meaning when a new version of the Project or RC viewer is released you have to install the update to continue using it. NOTICE: If you click SLURLs to open your viewer and login into the SLURL’s region, installing any viewer will change which viewer Windows uses. Windows uses the last viewer installed. There are tools and tutorials that will help you tell Windows which viewer you prefer for those clicks. See SLURL Proxy. Posted in Second Life, SLV2, 3, 4, 5, & 6 Series, Viewers. Tagged EEP, Tutorials, Viewer Tutorial. The planned roll out to the main channel (leaving us running #19.01.25.523656) was canceled due to a bug in the logging. So, no restart to the main channel. Main channel regions got a restart last week. The Deploy notice was posted Monday and revised Tuesday. So, if you are confused, it is because of late breaking changes. Blue Steel and Le Tigre will update to #19.02.08.524296. This includes the EEP feature, which is to being installed in more regions fo broader testing. Posted in Catznip, Firestorm, Second Life, Server, SLV2, 3, 4, 5, & 6 Series, Viewers.